Back in October 1st I presented a physical to digital MashUp project in Major Studio. The title for my project is Social Recycling. 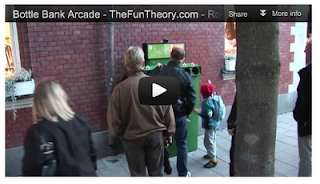 I was inspired by these artists of The Fun Theory recycle bottle arcade game. 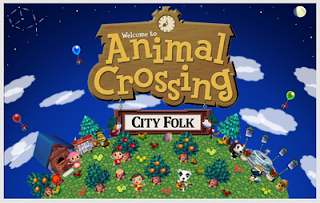 And also Nintendo Wii Animal Crossing, City Folk. For it's groovy and fun environment. How the social recycling would work; when you place you recycling in the recycle bins. 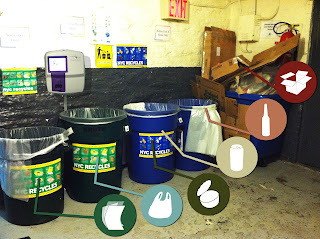 The bins would have sensors that registered the item and translate you recycling to a Facebook.com social world. 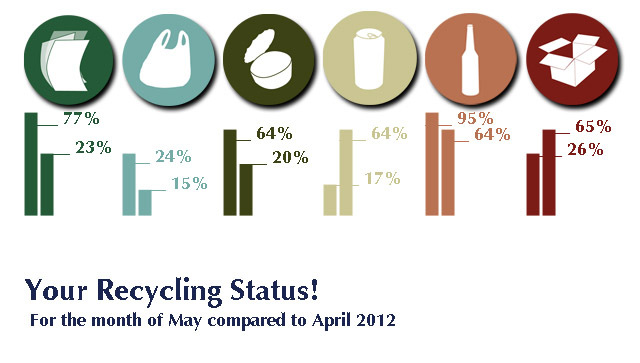 There you and your friends can see the positive effects of your recycling. As you recycle the environment becomes cleaner. The sky gets brighter/bluer, the water becomes drinkable, more flowers grown and more people (friends) you can invite to live in your world. For my final project, I want to continue where I left off with my MashUp: Social Recycling. I am not sure how doable this might be. Given the little I know about anything, but I feel like I can make something happen with these ideas. 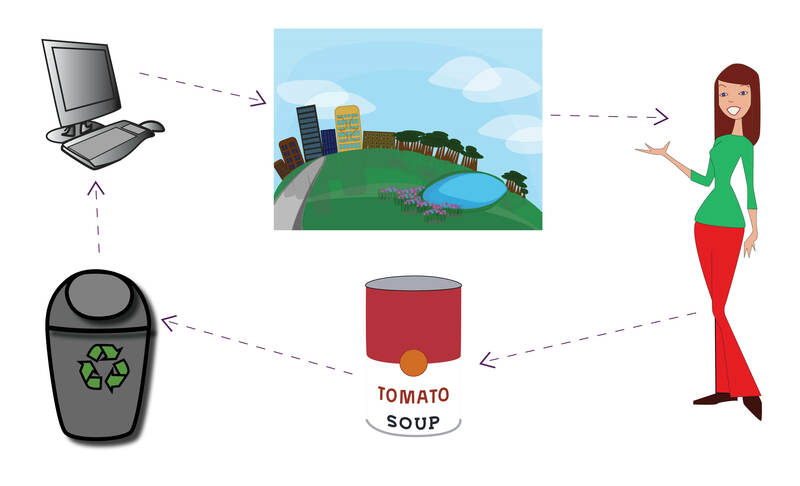 The general ideas for the MashUp assignment was to create a social environment where your recycling made an impact in a digital world that mirrored your own. Coming from New Mexico where the positive effect of recycling are seen almost on a daily base. In the coffee shop I worked at we used Eco friendly cups, plates, etc and most of it, if not all our customer recycled the cups or used them the next day. Being here in New York, I see recycling sign and bins everywhere but I don’t see the effect so much. I still see trash everywhere. I want to try and use the tenant in our apartment building as a part of a social experiment -- Since I presented this assignment to my Major Studio class I have changed the location of the project to D12 (Parsons) -- Would they be more excited about recycling their trash then getting a tweet? Or if they saw how much their recycling effected a social environment would it make then more interested in there own? 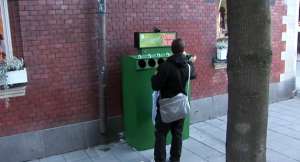 This is still a vague concept and my thoughts are all over the place, but the bottom line would be to create a recycle bin in the same vain as TheFunTheory.com created their Bottle Bank Arcade. Then showcasing in a digital format, social network, how the person recycling effect their digital world and then how it could effect the real world… I’m still working on this. 1. What is the project and who created it? - by TheFunTheory.com. The project is a glass bottle recycling game. 2. How does it work / function? Is it interactive? If so how? - The interface is simple to understand, like a pinball machine or ball toss game. You accumulate point when you place a bottle into a slot when the light blinks. 3. What aspects of the project are similar to your project or influence your project? – The visual design? The interaction? The industrial design? The location? The Audience? - It’s fun and creative way to to recycle. My project relates to this one through the interaction of random people. 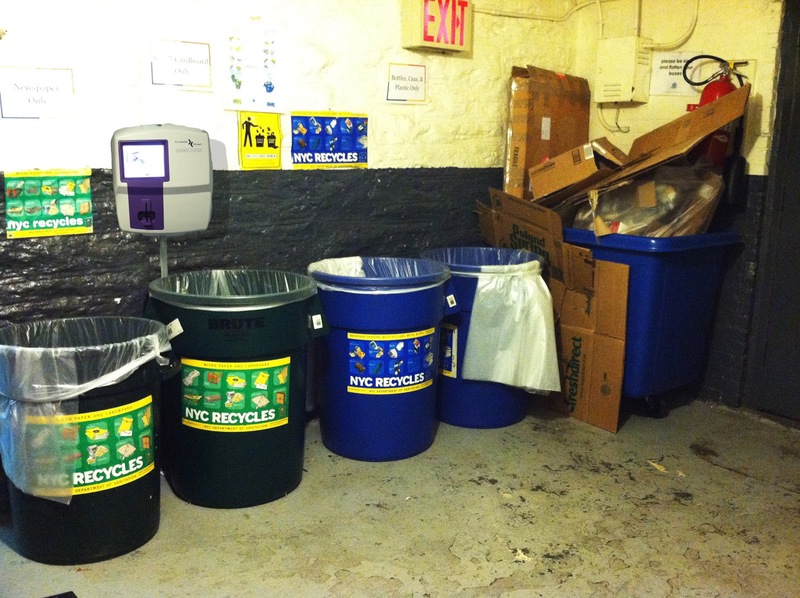 The want to recycle is encouraged by the outcome of what you recycle. 1. What is the project and who created it? - by Nintendo Wii. 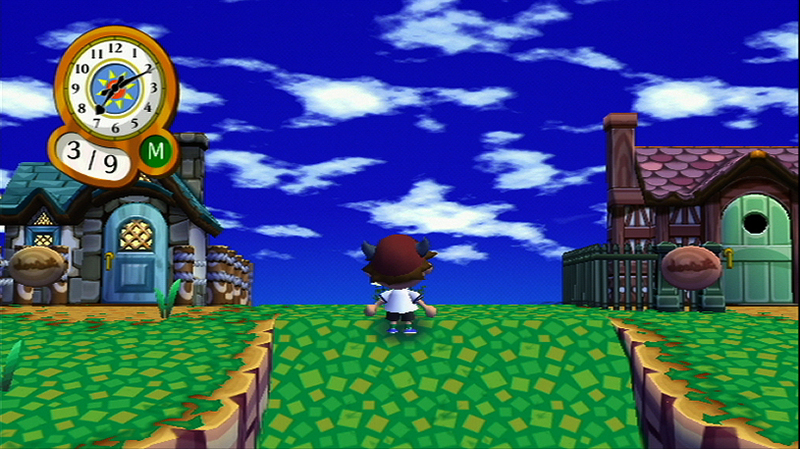 This game is set in a world that totally depends on you. You have to keep the world clean, you have to build, shop, work in the city in order for it to survive. Just like in my project the virtual world look depends on you. 2. How does it work / function? Is it interactive? If so how? - The environment depends on you. You go out pick weeds, plant trees and kill bugs. All these action help keep your world nice and inviting. Because you want people to live in your city. The better the looking the city the more your city grows and the more you can do in your city. 3. What aspects of the project are similar to your project or influence your project? – The visual design? The interaction? The industrial design? The location? The Audience? - You have to keep you city clean. The cleaner the city the prettier it looks and more awards you receive. In Animal Crossing you pick weeds to make your city beautiful. 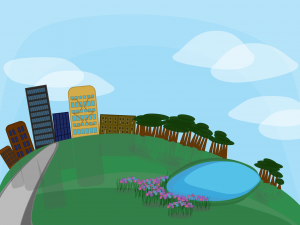 For my social world element of my project, the more you recycle the better your world looks. 1. What is the project and who created it? - by Guerillapps. 2. How does it work / function? Is it interactive? If so how? 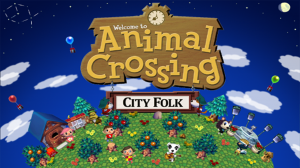 - SIMS type of game and Animal Crossing this world depends on the way you level up. The higher the level the more you have done to make the world better. YOu are given task to do and depending how well you performed them the more levels/point you get. 3. What aspects of the project are similar to your project or influence your project? – The visual design? The interaction? The industrial design? The location? The Audience? - You are a member in a virtual world where it is your responsibility to keep it clean. I started working and developing the social environment. This was the first drawing of the social world. 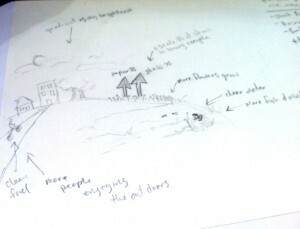 First draft of the vector drawing of the social world. As the owner of the social world recycle the cleaner the world becomes. 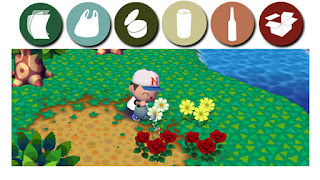 More flowers will grown, the bluer the sky becomes and the world starts developing a social environment, but when you stop recycling the world goes back to being trashed. Yet the more you recycle more changes and becomes cleaner in your world. Showcasing the steps of the user. This is a images that shows the Arduino and sensor I will use to create the social recycle interaction. Top L: the flex sensor. Top R: Arduino w/ button. Bottom L: the environment with no flowers. Bottom R: environment w/ tons of flowers. 2. Building a Recycle Bin that I can install the sensor in such a way you will not be able to see it. 3. Coding the Sensor. Right now I have a Arduino button working with Processing that will grow flowers in the in the social world. But it needs more work and I want to use the sensor instead of the button. 4. Redesign the social recycling world. 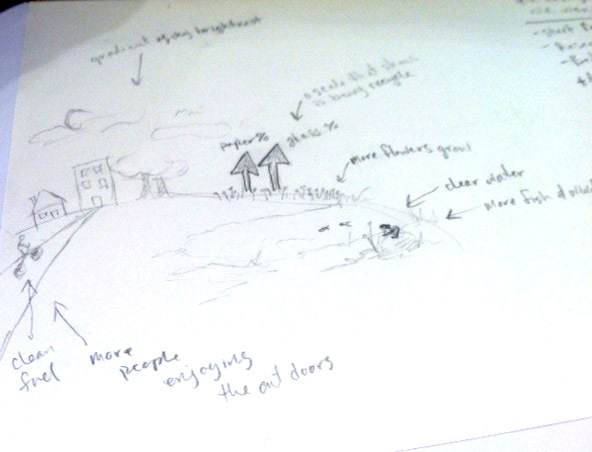 When I presented the first draft drawing of the environment the major critique I got was it wasn't realistic to the users real world. So I'm gone back to thinking about a new look for the social world. Feedback, Comments, Et cetera are all welcomed.